You may think that the furnace in your home is the heating system that does the most work during the year. But the majority of your annual heating budget goes to the water heater. After all, it works every day of the year, no matter the temperature outdoor. It puts in more work during winter (because the water entering the tank is cooler), so if you’re planning to install a new water heater, the beginning of spring is an excellent time to have it done. But you don’t have to put in the same type of tank water heater you’ve have for years. 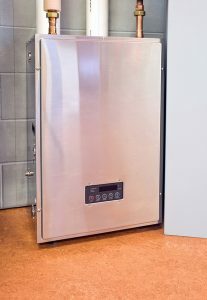 Storage tank water heaters are the most common across the country and are what most people think of when they think of water heaters. But there are other options, such as the tankless water heater.